Watch our screencasts to get an understand of how to use Cranium CoRE and the methodologies behind it. 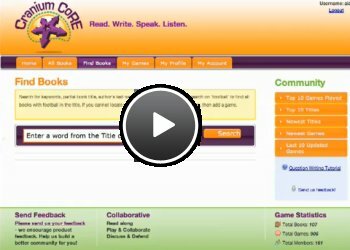 The screencasts below narrate you through getting started with Cranium CoRE all the way through to playing your first game. All the while explaining the philosophy behind the Cranium CoRE methodology. This explains how you can use the All Books functionality to find books in our system. 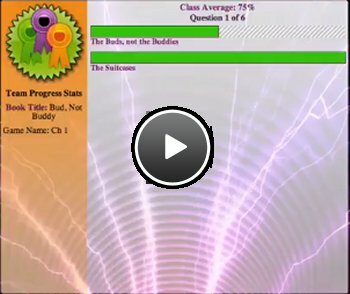 From there you can review the games for each book and even view the questions/answers on those games. This explains the Cranium CoRE game play interface and controls. It also explains the philosophy of playing the team based game. 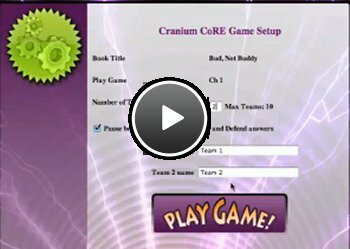 How game Cranium CoRE game scoring works and how the points differ based on the questions answered. Explains the importance of the Game Alert which is part of the Cranium CoRE philosophy to discuss and defend your answer.